This list looks at interesting and useful features that automatically come on your Tab 4 NOOK. Wade right in and see what else you can do with the Tab 4 NOOK as delivered. You can find the Alarm app in the Apps menu; just look for the imaginative icon of an alarm clock. Tap the icon to display its simple charms. Your alarm will sound even if your tablet is sleeping (just like you). When the alarm sounds, drag the red X outside of the large circle to turn it off. If you turned on the snooze, drag the yellow Zz icon outside the circle to steal a few minutes more. Don’t throw your tablet out the window; it could hit someone. If you use the same Google account on your tablet and your smartphone and your laptop, they’ll be synced. You can change your calendar on any device, but syncing depends on an Internet connection. If you’re not online at the moment, then the device syncs the first chance it gets. To connect an Outlook.com calendar to your Android calendar, you must download a free app called Outlook from the Google Play Store. Reminders display across all devices that are synced to the same calendar. Five tabs are at the top of the calendar: Year, Month, Week, Day, and Agenda. Tap one to change your view. Tap an event to see a full description. If you’re syncing events from several calendars onto your Tab 4 NOOK, each will have a different color bar alongside. Tap the Settings (gear) icon in the upper right. Turn on (or off) the sync to see different calendars and to see their color code. The Tab 4 NOOK comes with two free cloud-based storage options: Dropbox and Drive. Those options are helpful for tablet users when you use your tablet as an adjunct to your desktop computer. You can set up cloud storage to store copies of all photos you take with your tablet; you can later delete them from your tablet to save space and then download them from the cloud to your desktop or laptop computer. Use the Maps app to search for restaurants, hotels, hospitals, and just about anything else in this wide world. If you want to know where you are, you must turn on the GPS. You can do so by tapping the Settings (gear) icon. To see if it’s on, swipe down from the top of the screen to bring up the notification panel and check for the icon. If you’re asked to allow the system to use Wi-Fi systems to fine-tune its ability to find itself, I recommend doing that. 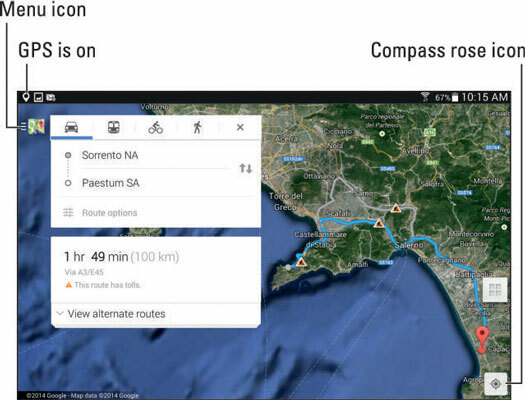 You need an active Wi-Fi connection to see a Google map of where you are, and to plot a course. If you connect to the Internet using Wi-Fi and get the necessary map, you can go off Wi-Fi and still see the last map displayed, which will be some help. The Memo app lets you make short notes, but it ties into other features on your tablet. For example, you can send a memo by email, Gmail, Wi-Fi Direct, Bluetooth, Drive, Dropbox, and more. Tap the microphone in the upper-left corner of the memo to record your voice or any other audio to the message. And if you have what is commonly referred to as “fat fingers,” tap the larger microphone icon on the keyboard to dictate your memo. You can edit or change any document you create. If you already have a Netflix account for your TV, you can access it from your Tab 4 NOOK. (At the moment, you can’t get popcorn and soda streamed to your tablet via Wi-Fi.) If not, you can set up an account right here to stream television series, current movies, and classics. One key point: Make sure you have a strong, fast Wi-Fi signal for streaming video. A weak, slow signal will remind some of you of the days before cable, when a distant broadcast channel looked like it was being broadcast through a snowstorm. Swipe down from the top to see the strength in the notification panel. The Galaxy Tab 4 NOOK camera is very basic, but it’s nevertheless a camera, and the photographer’s eye matters most. But even the best photographer needs to go into the darkroom — or now, the digital darkroom — to adjust brightness or contrast. The Photos app, from Google, does all that and so much more. How about teaching your tablet to respond to your questions? The Tab 4 NOOK has two personal audio servants. 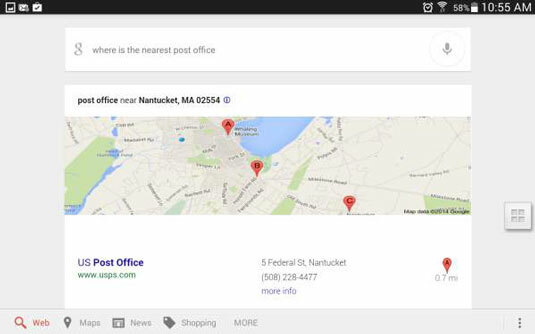 The Google system is the more full-featured, hobbled mostly by its uninspired name: Voice Search. Use Voice Search to issue a command. Samsung’s version of voice recognition is called S Voice, and it’s quite capable as well. You can ask, “Will it rain tonight?” or command it to “Turn on Wi-Fi” or “Show me the calculator” or “Play music.” S Voice has a pleasant tone and engages in polite discourse. Here’s a slightly hidden trick: You can open S Voice by double-pressing the Home key. Tap the Menu icon for other voice settings. 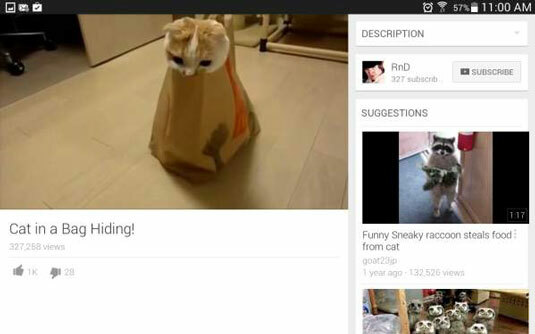 Tap the YouTube icon for a quick connection to a seemingly endless supply of videos of kittens who think they’re trapped in a grocery bag. You’ll also find very amateur films of parties and celebrations for people you don’t know and probably would never want to meet. 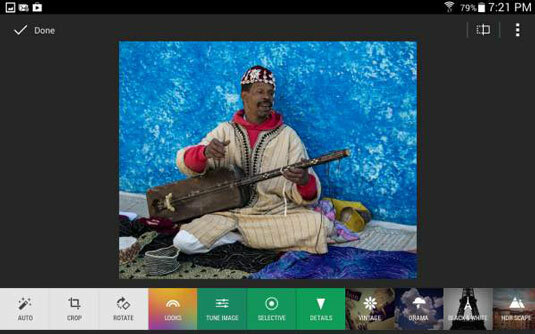 And you can upload your own video for the world to see, right from your Tab 4 NOOK. Use the YouTube app or tap the Share icon in the Gallery where your videos are stored. Your Google account ties into a YouTube account. Funnily enough, the first truly electronic device that many people ever touched — way back in the 1960s — was a calculator. Today, you just tap the Calculator icon in the Apps menu. Hold your tablet in portrait mode (taller than wide) and you’ll see a simple calculator with basic mathematical operators. Then, you can turn your tablet sideways either direction (wider than tall) to see the scientific calculator with all of those symbols you learned about in high school and have long since forgotten.